I can’t believe that I have neglected the blog for 2 years. It’s not that I didn’t want to blog, but that I haven’t dedicated my time to it. Sure I have taken lots of pictures of projects we have done, but sitting down and writing has been a challenge to say the least. As I look at our blog I see that a lot has changed in our home. It makes me sad that I haven’t posted updates. I also looked at my drafts and saw there are a few post that I have written and never published because our pictures were lost, which also makes me sad. So today I decided I am going to start over again. Start with a new post and a recent project. Do you ever feel like you have too many accessories?? Well actually I don’t feel like I have too many, I feel like they aren’t organized. I just wanted a place where I could just look and actually see what I have. There were too many times that most of my necklaces were all tangled together. I spent more time untangling than getting ready. Most of my jewelry ended up on top of the dresser or in a box. 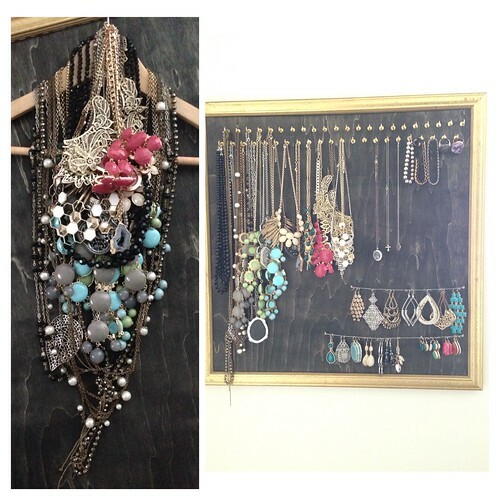 So in order to resolve that problem I decided to hang all of my necklaces on a hanger. Which didn’t help the tangling part of my problem, but I was able to pull out the hanger to see what I had. It’s a HOT MESS! Just looking at this hanger made me angry. Although it did help with the mess on the dresser, just looking at this hanger made me angry. I realized I couldn’t see everything. 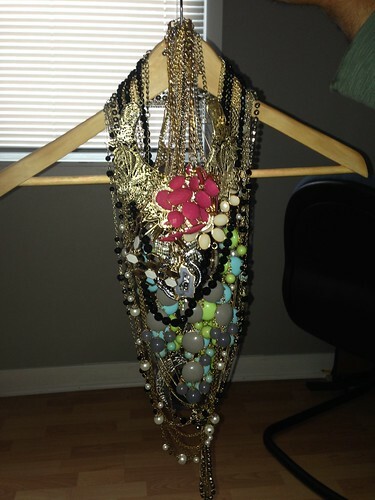 When I wanted to wear a necklace I had to take most of the necklaces off of the hanger to get to the one that I wanted. If I was in a rush the necklaces didn’t go back on the hanger. This was definitely not working for me. One day as I was online I saw an article for personalizing your PAX Storage. Since we have one in our closet I figured I should do the same. Unfortunately Jimmy didn’t want me to use one huge space for just my accessories so of course we had to come up with another solution. So here is our version. We had a couple of picture frames lying around that we haven’t used. We actually got it for free from Jimmy’s brother who went to a hotel sale. Since it was sitting on our of closets since we moved in we decided it was time to use it. 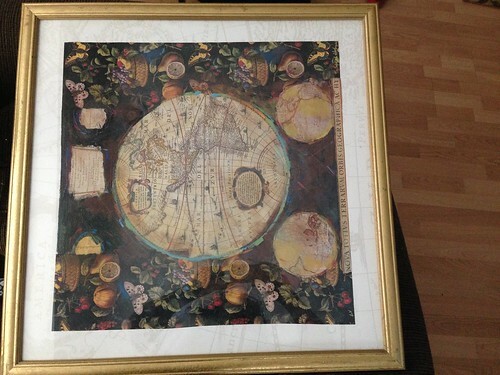 We removed the picture and glass from the frame. Then went to Home Depot for a piece of wood that would fit into frame. While we were at Home Depot we bought some hooks and wire. 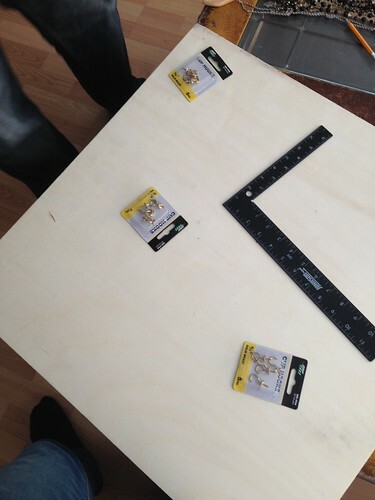 Then we measured out where we would put each hook and screwed the hooks half way in. 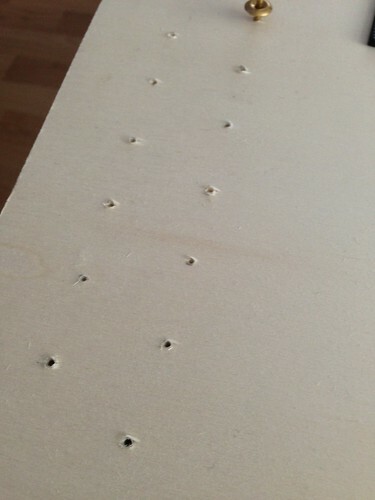 Once the holes were made we took the hooks off. We then decided to stain the board. We had some leftover stain from previous project., so we put that to good use. We just did one coat of the stain. 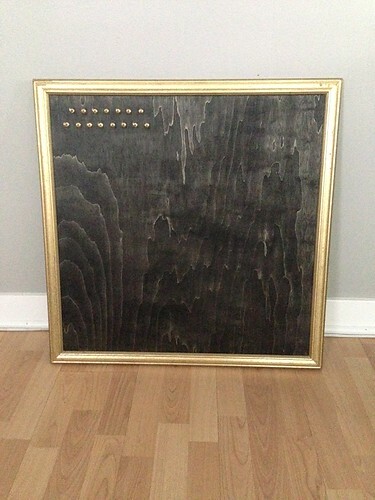 Once the stain dried, we added the hooks and put the board in the frame. Of course I wasn’t satisfied with the amount of hooks. I wanted room to grow. So Jimmy trekked back out in the cold to get some more hooks. Here is the finished project with plenty of room to grow. What do you think?? 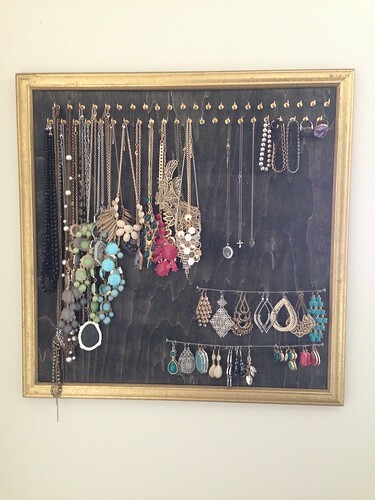 I think the best part is that we didn’t have to spend an arm and a leg buying a jewelry organizer. love it! great idea, winc!